Back in the Autumn of 2007, about a year after Matthew was born, a friend introduced me to the world of running. In an attempt to get fitter and drop a bit of weight I started to pound the pavements either early in the morning, just as the dawn chorus started, or as the sun set at the end of the day. At first I couldn't even run 100 metres before having to stop and catch my breath, but after a couple of months my fitness improved and I was soon able to jog my way round a 5km (3 mile) route comfortably. The same friend then asked me if I would like to enter a running event which was due to take place a month or two later. It was a 10km (6.1 mile) race in Staines, Middlesex. I somewhat nervously agreed and devised a training plan to increase my mileage in preparation for the event. I will never forget the feeling I had as I stood at the start line with some very serious looking runners alongside me. To be honest I felt like I shouldn't have been there as I knew that there was absolutely no way I was going to be able to compete with all the super fit people around me. However, I quickly realised that the race wasn't actually about how fast I was in comparison with others - it was all about me achieving a personal goal and competing against myself to see if I could push my body just a little bit further and a little bit faster than before. I soon also saw that by entering such events I was able to motivate myself to keep running throughout the year as there was always a goal to work towards. Therefore, over the next 2 years I entered and participated in a number of different races and at the same time increased my race distance to the half marathon (13.2 miles). Everything was going well until late 2009 - I was training to take part in the Windsor Half Marathon for the second year running when I injured my knee and found myself unable to run for an extended period of time. The frustration at not being able to get my trainers on and set off out the door 4 or 5 times a week eventually turned to resignment and I soon found myself playing the part of couch potato once more. Eventually I became determined to reap the benefits of structured exercise again and put my trainers back on, but this time to power walk my way around the local neighbourhood. I found that this didn't aggravate my old injury and I was also pleased to find that I actually still appeared to be relatively fit. Within a month of starting to train again I completed the Windsor Twilight Walk, a 13 mile walk around the beautiful sights of Windsor and its Great Park. Spurred on by this I then entered the London Moonwalk in 2011 (I was a volunteer at the event in 2010). This annual event starts at Midnight and involves mostly women walking either 13 or 26 miles around London in decorated bras to raise money for breast cancer research. I was very proud to complete the full 26 miles in a fraction over 6 hours and at the same time raise funds for such a worthy cause. Just 3 months later the family was teleported into a whole new world as we made our move to Qatar. All thoughts of running were put to one side as we adjusted to our new home in the Middle East and with the news soon after that I was pregnant! 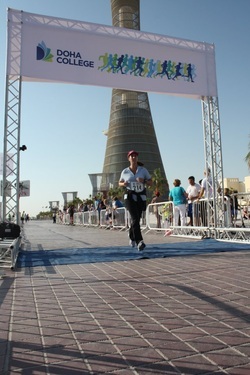 Fast forward to late 2012, when Ethan was a few months old, and I dabbled with the idea of running again by half heartedly training to run in the Doha College 10km race. I completed it but was so disappointingly slow compared to my performance in previous years that I lost interest in the sport, using the heat, not having any time, etc as reasons why I couldn't train. This week my friendship with running has shakily become reacquainted. I have started a brand new journey, which has some similarities to the one I commenced back in 2007. This time however I am a little bit older and somewhat heavier than I was then, but after 3 consecutive nights of walking out the door to pound (or plod!) the pavements I am beginning to remember why I used to like to run so much. Maybe completing 5km in 34 minutes is a far cry from the 27 minutes I used to be able to do it in but I know that it will get easier as the days and weeks pass by and that gradually the walking breaks I currently need to take will reduce and disappear. I may now be 40 but I am determined to get my body back into shape and can't wait to be able to show off a leaner and fitter me over the coming months!! At the end of June I celebrated my 40th birthday but unfortunately, rather than feeling fabulous at 40, I was actually overcome by the feeling of being fat at 40! Fast forward just over a fortnight to this week and we have now also just celebrated Ethan's first birthday, swiftly followed by Rebecca turning 13. It shouldn't have been a time to shy away from having my photo taken with my beautiful children as they reached these memorable milestones, but the sad reality is that I now hate having pictures taken as they just serve to remind me of how big I have become. Ethan's first birthday represented me weighing a whole stone more than I did just a week after he was born, and Rebecca's birthday cake with the number 13 on it symbolised not only our daughter entering her teenage years, but also me tipping the scales at almost 13 stone, a number I have never ever seen blinking back at me in a non pregnant state! How do I feel? Ashamed at what I have become, embarrassed that nothing fits me anymore, upset that I can't bear to look at myself in the mirror and completely responsible for the fact that I have let myself expand to this size. At the moment I am at home in the UK and I have 6 more weeks until I return to Doha. In some ways it is easy to put on weight living in Qatar due to the heat and resulting lack of opportunities for outdoor exercise. Here however I have no such excuse, so the fight to get rid of the flab starts now! The aim - to lose at least a stone before heading back to Doha at the beginning of September (2.5 stone in total). How will this be done? - Through eating more healthily and by exercising at least 5 days a week.